represents who you are as a writer and many times, no matter how fictional your work is, it becomes melded into the way you are perceived. However, this is one characteristic that you can control. So, be sure to put your best foot forward. You want your book to be wearing its Sunday best when it’s out in the world. From the cummerbund to matching socks, you want your book to be wrinkle free of spelling and punctuation errors. You want it suited up to be in the best presentable format it can be in. You want to seduce your reader like a James Bond in a classic Aston Martin. And the best way to do that is to start by getting lots of peoples’ input. So many people send out manuscripts that are half-baked. If someone was coming to your house for dinner, you definitely wouldn’t serve your friends a nasty, mushy, half-baked cake. But we see writers who want to get published do this all the time. Unless you have recently turned up in the pages of People magazine or have already sold a treatment of your unwritten novel to a Big Hollywood Film Studio, chances are you’ll need to write the whole enchilada before you start trying to sell it. You will probably have to keep editing until it has been road tested and test-marketed by as many readers as you can get and it has been proofread and edited by trained professionals. Yes, of course, take all suggestions with many grains of salt. But if 10 people say your ending is not satisfying, guess what….Chances are, your ending is not satisfying. Writing a good novel takes a long time. Use that time to develop contacts by reaching out to people and doing nice things for them. People will be able to help you. As you are writing the book and making it perfect and rewriting the book and making it even better, you are collecting your tribe of people so that when the book is finished, you arrive at a publisher or an agent or a publication date if you decide to self published your book, with your tribe in tow, ready to go. As you start to send your baby out into the world, constantly remind yourself that the greatest writers in the world, from Dr. Seuss to Stephen King to even J.K. Rowling, were rejected a multitude of times before becoming trend setting bestsellers. What makes you think you are any different? 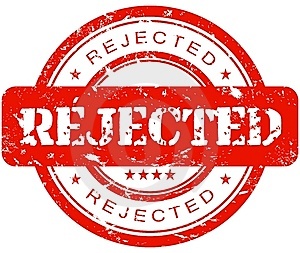 Jack Canfeld and Mark Victor Hansen (authors of the, now franchise, Chicken Soup for the Soul) were rejected a whooping 140 times before being published. Publishers are terrified of stepping out of their comfort zone, especially since they have no idea of what will work and what will fail. It’s a sweet irony that as soon as you sell a bunch of books, the same people who rejected you will be all over you like a gaggle of hormonal teenage girls trying to get a date to the prom with the cool kid. We met last year at the Book Expo in NYC. I wrote “Mind Your Manners Minnie Monster.” I love your book and the 20 minute consult was very helpful. I got over my fear and started a blog. Not about manners but about the fact that on Jan. 1 of this year I was size 14 and felt miserable. So at at 38 and size 14 I entered a bikini competition. My blog follows my adventures and gives the diet that dropped me from size 12 to size 5 in one month for FREE! (The blog is kinda like “Dirty Dancing” (but with weights!) meets “Rocky” meets the sitcom The Middle. Anyway, I was nominated for a blogger award and linked your website as one of my favorites. http://sheslosingit.net/2012/06/29/ive-been-nominated/ Thanks for your help! I wanted to let you both know how much I LOVE, LOVE, LOVE your book! I found it packed with so much vital and relevant information that it now has pages and pages of rainbow coloured stickies marking all the items I want to reread. As someone who doesn’t believe in reinventing a wheel that works, I have implemented what I have learned from your book and am excited to see the response I receive from the new queries I recently sent out (yes, I sent one to Arielle too). In the meantime, I am living, breathing and schmoozing with my on-line community and writing, writing, writing. As a Canadian, I wish that perhaps someday you could visit us up in Toronto. Just hoping! !Again, thank you both so much for the mentoring I have received through your book. I’m so sorry it took us this long to respond. We missed this! THANK YOU SO MUCH for your lovely words. They mean so much to us! We would absolutely love to come to Toronto. Any bookstores you recommend?